Snack Girl has a confession to make. She has begun to receive MANY snack samples in the mail. My new notoriety can be a good thing. First of all, I have made a new friend - the UPS guy. He chuckles whenever a new box of food arrives. Also, when I get a lot of something and can't (or don't want to) finish it, my local food pantry gets a gift of unopened snacks. But, the best part of receiving all these samples is that I find some new yummy stuff! These Sahale Snacks really surprised me and caught my attention. Their "Soledad Almonds" include apple, flax seeds, date, balsamic vinegar, and red pepper. Will this combination of tastes work? How about their "Valdosta Pecans" with sweet cranberries, black pepper, and orange zest? I gotta tell you. I was fearful when I opened the package, but they were both delicious. Like, "I'm going to buy them for myself delicious"! and all the ingredients were simple and recognizable. The 2 ounce size is absolutely perfect because it is the right amount for a quick snack between lunch and dinner. These are a great option for putting in your purse, backpack, or briefcase when you are running around town. They aren't cheap ($2 per package) but they are delicious. You can buy them at Starbucks, on Amazon (below) or find them at a store near you using their Sahale Store Locator. Find them on Facebook at Sahale Snacks. 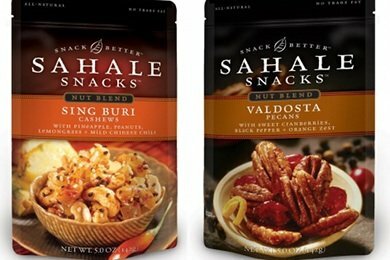 Sahale Snacks is giving away a $20 package of snacks to a Snack Girl reader. Comment below on your favorite spice and nut combination to enter. A box of Sahale Snacks (5 ounce size) including Sing Buri Nut Blend, Valdosta Nut Blend, Glazed Cashews, Glazed Almonds ($20 value). Comment below on your favorite spice and nut combination. The two winners will be announced on January 28th, 2011. You will have 2 weeks to e-mail us back with your home address so we can mail the prize. Wasabi almonds are my favorite, followed very very closely by candied cashews. So good! I think the Soledad Almonds look good. I have been a Sahale fan for some time and love their smaller bags. I love salty sweet so cocoa/cayenne or chili/cinnamon always works. I'd have to say cashews and anything...right now I have a trail mix with cashews and dried cherries. Love it! I love very spicy almonds with dried chilies. I'm also a big fan of the wasabi soy almonds offered by Blue Diamond. The almonds and cashews sound super tasty! I love the combo of cocoa and chili powder. Sweet and spicy! I think I tried this brand's slightly sweetened cranberry kind and was blown away. I think those were the best "flavored" nuts I've ever had! I love them too, I have tried the almonds and pecans.....they would make great gifts too! I saw the valdosta in a big bag at costco....must buy it next time! I was pondering a package of Pomegranate Cashews just yesterday in line at Starbucks -- but, now that I've been to the website and read your review, the Valdosta Cashews are even more tempting! I love almonds and bet those would be great! The Sing Buri Cashews sound amazing! Can't wait to try them! I think both the almond and pecans sound amazing.